Tuition agreement form attached here. A. For new Catholic families registering in St. Ann Parish, documentation is required from the pastor of their previous parish attesting to contributions for the previous 12 months and which clearly states that they were at the level required by that parish. If said documentation cannot be obtained, there will be a $780.00 surcharge added to the tuition amount. B. For new Catholic families who enroll their children in St. Ann School and who retain membership in their parish, a letter is required from the pastor attesting to offertory support at their parish recommended level and also to an active parishioner status. If said documentation cannot be obtained, there will be a $780.00 surcharge added to the tuition amount. Families must maintain regular contributions to the offertory at the minimum level to retain parishioner rates. The business office will periodically (quarterly) review the contribution records. Families which fall behind will be notified. If an arrears exceeds 3 months, and lacking any agreement with the parish, parishioner status will be revoked and a monthly invoice will be sent to the family at non-parishioner rates. Non Catholic families are required to pay the non-Catholic rate. Regarding Financial Difficulties: We recognize that situations develop making it very difficult for families to meet financial obligations. We do not want your child(ren) to miss a Catholic education, but you must call the rectory office at 654-5519 and discuss such situations with us. Please know we will treat such situations confidentially. 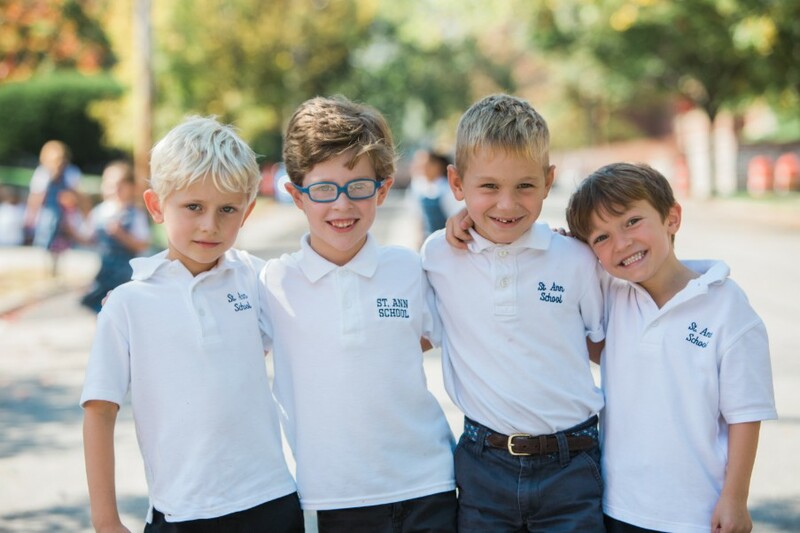 Special note: A non-refundable 10% tuition down payment is required from all first-time families whose children have been accepted into St. Ann School. The deposit will be applied towards the tuition amount due for the school year. Families must be officially registered at St. Ann Parish for at least one full year. The family must also meet the following criteria: (a) regular attendance at Mass, (b) minimal contribution to the parish (the amount is $15 per week), and (c) a willingness to be involved and participate in parish activities. Parishioners are expected to support the Parish in the Regular offertory. The minimum expected donation for the new school year will be $15 per week or $780.00 per year. The office staff will occasionally remind families for this expectation to support the parish. Families who are members of other parishes but who have children in St. Ann School must annually present a letter from their parish pastor attesting to their support of their parish at the level recommended by that parish. Failure to produce a statement from their parish will result in an increase in tuition of $780.00 for the school year. The calculation for the parishioner rate is the anniversary date of registration. For example, should a family register on December 1 of a given year, December 1 of the following year is the anniversary date. Option 1. Full payment by July 1 of each year. There is a 2% discount given with this option. Option 2. Semi-annual payments due July 1st and January 1st of each school year. Option 3. Automatic monthly withdrawals. Withdrawal period begins July of each year and continues for (10) months. Option 4. Bimonthly withdrawals (20 Payments). Withdrawal period begins July of each year through April. Withdraw dates are mandatory 5th & 20th of each month. Option 5. Credit Card Payments through FACTS. Parents pay a monthly convenience fee to FACTS with payments. Parents must call FACTS directly to enroll. (800-233-1096). Delinquency: Families in arrears with tuition will be notified. A tuition account is delinquent five (5) days after the due date. A late fee of $25 or 5% of the delinquent amount will be charged after the grace period. An NSF fee of $25 will be charged on all returned checks. If failure to pay tuition persists and no notification/discussion with the parish business office has occurred or any family that does not abide by the financial tuition agreement, the parent will be asked to withdraw the child(ren) until the account has been satisfied. Unless there are serious circumstances mitigating such action. Tuition Refunds: Enrollment in St. Ann School is a financial commitment from the Parish and the parents. If children are removed from school either by the school’s request or by the family’s request, families are required to pay an additional two (2) months tuition from the date of the removal of their children. Please Note: All tuition and fees must be paid in full by May 15th of each year. Registration, final report cards, diplomas, transfer records, etc. may be denied or withheld until all tuition and fee accounts have been paid in full for the academic school year. Financial Assistance: If parents are experiencing financial difficulty, temporary arrangements may be made by contacting the Parish office at (302)654-5519. Beforecare: This program is available before school and costs 50¢ per day per child. Please pay-as-you-use. Aftercare: This program involves supervised study and recreation of various types. Children are expected to bring play clothes and a snack. It is only available to students currently registered at St. Ann School. Aftercare is available every day school is in session, from dismissal until 6:00pm. Children must be signed out when they are picked up. This is a state law and is required for the safety of the children and for accurate record-keeping. Any special arrangements must be made in writing and delivered to the Aftercare administrator in advance. Payment: For the 2019-2020 school year, St. Ann’s will offer three (3) payment options. All Aftercare accounts will be reviewed each month and payment reminders will be sent for those which are delinquent. Late pick-up fee: $5 per child when picked up between 6:00 & 6:10pm. After that, $1 per child for each additional 5-minute interval. Plan A: FACTS automatic Withdrawal. $10 per day per child (including half day dismissals). An agreement must be signed with FACTS Management for automatic withdrawal on the 20th of each month, beginning in September. The cost of the FACTS agreement is $45 per school year. For families who will have a tuition agreement with FACTS, and who will use the same bank account for Aftercare and Tuition withdrawals, there is NO additional cost for the Aftercare agreement . New Families can enroll for a FACTS Accounts beginning May 1, 2019. Use the chart to choose the option (1-4) which best reflects your estimated monthly AfterCare usage. Plan B: Advance Payment. $10 per day per child (including half-day dismissals). Payments must be made directly to St. Ann School on the first of each month in advance of usage. Payments begin in September. There is no FACTS agreement for this option. Please estimate your usage and advance payment amount using the chart. If payments are not received in advance by the due date, then the Aftercare rates for those months may be calculated at the higher pay-as-you-use rate (Plan C). Plan C: Pay-as-you-use. $12 per day per child. $17 per day per child for half-day dismissal. There is no FACTS agreement for this option either. Payments must be made on a weekly basis. Special Note: If you do not choose a payment plan, you will be enrolled under Plan C.
“Average days of usage per month” in the chart below is per child. Please indicate your option choice and your total monthly payment amount on the enclosed Aftercare Payment Plan/Option Selection Form. Delinquencies: An Aftercare account is delinquent five (5) days after the due date. Delinquent accounts will be reviewed by the Business Office. If parents fail to cooperate, their child(ren) will be removed from the Aftercare program until account has been paid in full. A late fee ($25 or 5% of the delinquent amount) may be applied to all delinquent accounts after the 5-day grace period. An NSF charge of $25 will be applied for all returned checks. Please make all checks/money orders payable to St. Ann’s Church. Payments should be mailed or hand-delivered to the parish office or to the school. Please write the name(s) of your child(ren) on your check(s)/money order(s) and on the envelope you use. Include your parish ID/envelope number for prompt processing. If you do not know your ID/envelope number, please call the parish office at (302)654-5519.
Credit Adjustments for actual usage will be made/issued annually. All families are required to enroll and utilize FACTS for their payment arrangements (excluding Option 1). A tuition preference form must be completed and returned to the office each year.